How Do I Choose Whom to Vote For? This blog has been retired. For the foreseeable future, I will maintain the content here as is. Check out my current blog(s). Much ado has been made in the recent months about the impending death of <insert name of MS UI stack here>. This week, at BUILD, Microsoft has finally stepped up and shown us what their view of the future is. Note that, in their architecture diagram, the current "desktop" technologies are represented as a peer. Included in the right side is Windows Forms, which of any .NET technology has long been exaggerated as dead; and yet it is still alive. The point is, despite all the "future is Metro" talk by other analysts (e.g., Mary Jo herself), the fact remains that these are peer technologies, and Microsoft is not "killing" anything in the right side. In fact, there is no such intent expressed implicitly or explicitly. That's not to say, of course, that nothing has changed. 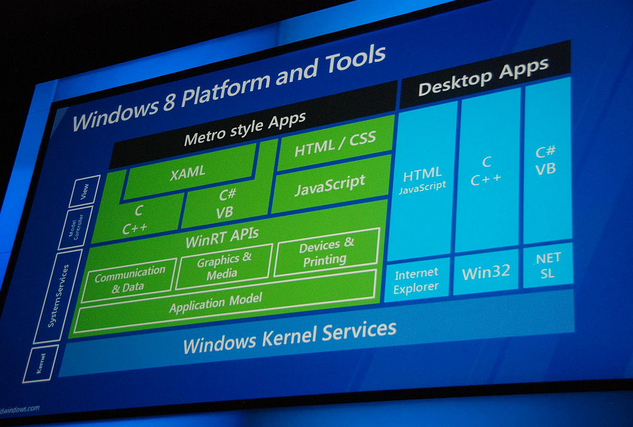 That's not to say that we can or should ignore Metro/WinRT (duh!). But there seems to be this common knee jerk reaction when a new technology is released to say that the current ones are now dead or somehow not worth investing in further. That reaction just doesn't reflect reality. As impressed and (mostly) happy as I am about the direction expressed in the Win8 stack, we need to keep in mind that we are still in the early stages, still in gestation. The baby isn't even born yet, and once it is born, it will take time to grow up and mature. In the meantime, we have these mature, stable, currently released technologies that are great to build on. I think it's great that Microsoft has released this stuff early. I like that about them better than other tech vendors. Although they've been more tightlipped about this than any other tech they've released, the fact remains we have plenty of time to plan, prepare, design, prototype, explore, and ultimately build for the new stack. In the meantime, we can still safely invest in the current technologies. The future is uncertain. That is the nature of the future. Devs need to quit unrealistically asking Microsoft to guarantee them the future of technology. We know that it would be bad business for Microsoft to kill off these current technologies; so bad, we should feel it as a positive guarantee that they are here to stay for any future that we should be currently planning for. We will always have legacy. Someday, the Win8 stack will, I assure you, be legacy. Understand the needs of your application context. Understand the capabilities, strengths, and weaknesses of the various technologies you can build on, including current investments. Understand your team's capabilities, strengths, and weaknesses, including current investments. And choose the technology stack that makes the most sense, best balancing all these considerations, realizing that you won't make all the right choices (in retrospect) and that this is just life as a software professional. Everything else is just a bunch of unnecessary worry and hullaballoo. The good folks over at Microsoft have released their Silverlight Toolkit today (or I guess yesterday, now). It's a good start to complement what you get in the core/box. I personally found the AutoCompleteBox probably the most interesting control, and the theming capabilities being introduced with the ImplicitStyleManager are promising, too. I also like the way the team is running the toolkit project on codeplex and all. Shawn Burke (of Ajax Control Toolkit fame) is a great guy to be leading that group of talented folks. Of course, in my humble opinion ;-), no discussion of Silverlight controls would be complete without looking at the outstanding work that Infragistics is doing, particularly in the data visualization space. In our current CTP that you can download now, we have the xamWebChart, xamWebGauge, xamWebMap, xamWebTimeline, and xamWebZoombar. If you go to http://infragistics.com/silverlight, you can read about all those controls, but I encourage everyone to just go play with them in our really awesome (if I do say so myself!) Silverlight controls samples browser. I mean, it is just plain fun tweaking around with it. 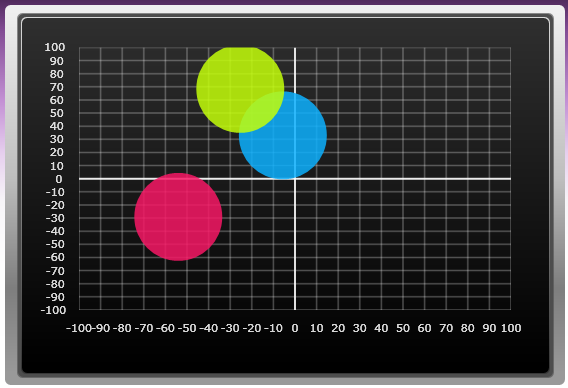 I could sit and watch the datapoint transitions all day, and the chart zooming is freakin' cool. Needle dragging gauge, overview plus detail implementation for the map, timeline... Heck, who am I kidding? It's all sweet! I'm not just saying that because I work there; I really was just having fun and am frankly impressed with the work our guys are doing. Kudos to our entire Silverlight team! Great job, guys! I'd name names, but I'm bound to forget someone. You know who you are! And the fact that I'm playing with this in Safari on my Mac over my crappy hotel internet access just makes it that much cooler and fun. You gotta love Silverlight! If you're interested more in Line of Business (e.g., Outlook bar, hierarchicial data grid, tree, etc. ), check out our info on Silverlight LOB controls. According to our roadmap published there, you should see a CTP of our first release towards the end of this year. Silverlight rocks, and I'm looking forward to seeing it develop and being a part of making it even better. You should stop by our booth at PDC, if you haven't already, and ask about all this. We're Booth #201 (about 3 down on the left from the middle entrance). There's still some time left, and you can pummel the guys and gals there with your questions. Of course, you can always just call, chat, or email someone as well (or use the contact link on this blog, and I'll put you in touch). Also, feel free to stop me in the hall at PDC if you want. I won't bite. Everyone says I look like Kevin Smith (which is why I was Silent Bob at the Expo reception Monday), so you should be able to recognize me, even without the trenchcoat. :) Now I have to get to sleep so I can keep my promise and not be a zombie (and ergo not bite). G'night! My most recent post on how I choose whom to vote for dived into a bit of depth on the two key principles that factor into my decisions in this important part of our lives as citizens in a democratic republic. One of my colleagues said to me something like "it's just plain silly to vote on one issue." Put another way, "life isn't the only issue, dude." This is actually a common sentiment, especially by those who, for whatever reason, want to justify voting for candidates who support (usually) abortion as part of their platform. And yes, it's true. There are more issues to think about than life issues and abortion in particular. No doubt about that. But to be a responsible voter, we have to think like adults--we have to weigh issues not only in number but also in importance, in consequence. For instance, is a candidate's position on technology of more or less consequence than his position on education? That's certainly debatable--there are many nuances and ways of tackling both of those, some of which would be a win-win. On the other hand, when you compare the consequences of a candidate's position on abortion to even something as near and dear to our hearts as the state of the economy (our own personal savings), which seems to be capturing folks' imaginations these days thanks to current events, there is just no comparison. I don't care if my life savings is wiped out. My pecuniary situation must take second chair to protecting the lives of the millions who have been and will continue to be killed with the consent of the law. Today, there are very few issues that can claim the priority and consequence of abortion. As explored in my last post, protection of life must come first. It trumps economy; it trumps education; it trumps health care; it trumps foreign policy, and it even trumps social services. If you don't have life, none of this matters. It is plain, simple, straightforward logic. If you vote for a candidate who supports abortion, you are consenting to and indirectly participating in the death of each and every baby who has its brains sucked out, who is mangled, chemically burned, poisoned, or killed in any one of the many diabolically creative ways they've figured out how to do take human life in a mother's womb. I apologize if it offends sensibilities, but you need to make an informed decision and realize there is real, moral culpability involved in voting for candidates who support abortion. Is your 401(k) worth more than these babies' lives? We can disagree on the propriety of the Iraq war (I have always opposed it but believe we are responsible to try to fix the mess we've made); we can disagree on the most effective means for social and economic stability; we can disagree on the death penalty, and we can argue about the right way to fix the environment. There are plenty of issues where good, honest folks can have good honest disagreements. We have to think about all these, but we also have to weigh them proportionately. [If I could do side bars on the blog, this would go there. So just imagine it being there.] A lot of folks, including Senator Biden, seem to think that when life begins is a matter of faith. It's not. Life is not just a religious issue; it's about as biological and primordially human as it gets. Human life begins at conception; this is scientific, not religious--if you don't interfere with a newly-conceived human being, he or she will develop into an adult human being. It doesn't matter if they're self aware or not; they're still alive and have everything, genetically speaking, they'll have as adults. You can't distinguish based on awareness--that's a slippery slope. What about the severely mentally retarded or the senile? What about newborns? What level of self-awareness do you require? What's the IQ score you have to have? Who decides? Obama has said that the first thing he'll do if elected is sign into law the so-called Freedom of Choice Act, which would have the effect of overturning all existing laws that limit abortion and making it harder for future limits to be created. He has a strong, indisputable record supporting abortion, which is why NARAL and other pro-choice organizations are so keen on him. When asked, he claims issues of life are "above his pay grade," but he has no reluctance to take actions based on this purported ignorance. As George Weigel wrote recently in Newsweek, "Is John McCain a perfect pro-life candidate? Of course not. But Barack Obama is a perfect pro-life nightmare." I really wish there were a party that embodied my perspectives completely, but that'll never happen. I think that's true for pretty much everybody, so we just have to decide what's more important and vote along those lines. For my part, I just can't see how anything is more important than protecting human life, and I can't deaden my conscience enough to vote for someone who has clearly deadened his own. Life isn't the only issue, but it is the most important one. In writing this first and hopefully last political entry, I hope to help others who struggle with the question “How should I vote?” or “How do I choose whom to vote for?” If nothing else, I hope it will contribute more depth to the often polemical and superficial discussion that is our political milieu. First off, let me say that sometimes I wish I could be a Democrat. 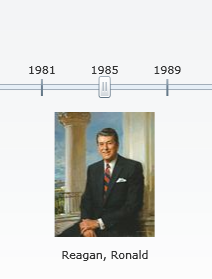 Democrats have a great story. They work for the average Joe. They want to make sure that the poor are taken care of. They want social justice. That’s admirable; that’s something I can get behind. For my part, I consider it part of my moral obligation to help the poor and those less fortunate. As a Catholic (or even just a Christian for that matter), it is pretty clear that caring for the poor is a basic moral principle for us, and what this means has been elaborated on and acted on throughout our two thousand year history. It has taken different forms as the cultural, political, and religious landscape has changed, but it was and remains a core concern for the devout Christian. You see there are those, both antagonistic and sympathetic, who suggest that a concern for others, a care for the less fortunate, should trump these more fundamental concerns. For some, this argument is purely rhetorical, but there are surely those who honestly believe in this perspective. Some of these people are close to me, and I don’t doubt their sincerity. The problem is, I think, that there is a failure to understand the connection between these more fundamental issues and governments’ role in them, to understand the pragmatic importance of these issues, or, in some cases, to even properly value them. The fundamental issues I am referring to are those of life, first, and family, second. Let’s begin with the first principle of life. Even our founding fathers saw the primacy and importance of this topic. Our Declaration of Independence begins with what they claim are self-evident truths, a list of unalienable rights, the first of which is the right to life. These are there to introduce the primary principles for which government is established and, in particular, our own here in these United States. It doesn’t take a religious perspective to appreciate the fundamental importance of life, and it is not a logical jump to understand that government, which should be directed toward the common (i.e., shared, social) good, should set as its number one goal to protect the lives of its citizens--all of them, especially those who cannot, for whatever reason, protect their own lives. It is from this fundamental principle of life that the other principles and rights both logically and practically flow. And therefore there is an implicit subjugation of these other rights (such as liberty and the pursuit of happiness) to the right of life. It follows then that a government can, in order to ensure the most fundamental right to life, restrict these others. I would suggest that it also follows that if a government inverts this order, it is inherently disordered and consequently needs to be corrected. For if a government cannot duly ensure the right to life, all of these other rights and, certainly, privileges are in no uncertain jeopardy. We must protect life first and foremost and, if necessary, at the cost of other admirable ideals such as liberty (or “choice” as some put it) as well as concern for the economic welfare that enables the pursuit of happiness (or property, as John Locke would have it). This is why I think that life issues must always trump economic issues (including care for the poor). If we don’t get life right, we have to seriously question both our priorities and maybe even our ability to properly think about care for the less fortunate. Similarly, we have to vote for candidates who have these priorities straight, those who understand the primordial and fundamental importance of life and government’s principle obligation to protect it in all forms, from conception through to its natural end. Because if they don’t then they--just like a government that does not prioritize life over liberty and other rights and privileges--are unfortunately and seriously disordered. However well intentioned they may be, we must seriously question their judgment and their ability to govern wisely if they do not understand the government’s priority to protect life. Let us turn now to our second fundamental issue--the family. It is often said that the family is the fundamental building block of society. This is true both in terms of societal stability but also in terms of the fundamental concerns of the perpetuation of a society. It is through the family that the future members of society come, and, therefore, it is through the family that the future of the society itself is perpetuated. Any human society that values itself will inherently value its own perpetuation; it is essentially societal self-preservation that we are talking about. From our earliest human origins, the family has been the normative means for the perpetuation of society in all its forms. It is the most tried and true (and logical) way for this self-preservation to occur. Similarly, the normative form of the family has been that of a man and woman. The simplest reason for this is, if for no other reason, due to our biological situation, our needing male and female to engender new lives. And given the very real (even biological) personal investment in the creation of these new lives, it follows naturally that those who engender them will normally be those who care for and raise them. This is of course ignoring the psychological and, dare I say, metaphysical factors that inform us that the biological parents should normally be the ones who take on the roles of mother and father. Any society worth its salt will do what it can to strengthen the normative family because it is, simply put, in the society’s best interests to do so. And we see this played out in those governments (like our own) that do create formal structures to support it, such as marriage and the many privileges given to spouses and parents in our laws. These privileges (not rights!) are there to support the normative family in hopes that it will further the perpetuation of the society and, by extension, our common good. Supporting the normative family (like life, though secondary to it) is a fundamental issue for government. Supporting and reinforcing this primordial social unit through which the future of society is ensured should therefore supersede other concerns. And ensuring its elemental structure--a man and a woman having children and responsibly raising their children--must supersede concerns about economic welfare because in the same way that life logically precedes the exercise of other rights and privileges, so the structure of the fundamental family unit logically precedes concerns about other social conditions. It is unfortunate that we have to make this priority explicit—because we should absolutely care about ensuring economic welfare—but this fundamental family unit structure is in question in our society today and is being pressed by many who recognize clearly the secondary concern of economic welfare. Sadly, we must first deal with this question and settle it correctly, in a way that ensures the fundamental structure of our society and consequently its perpetuation. Only then should we turn our attention to the very important concern of economic welfare. Again, since the essential function of government is to secure the enduring, common good of the society it serves, and since any society that values itself will preserve itself by ensuring and protecting the normative family consisting of a man and a woman having and responsibly raising the future members of society, it follows that we should elect members of government who will likewise work to ensure and support this fundamental unit of society. Right now, while the nature of the family is in question in our society, we must more than ever work to elect those who share this urgent priority to finally settle this issue in a way that is in the long-term best interests of our society. We cannot redefine and dilute the elemental structure of the family, however well meaning we may be, without endangering the long-term good of our society. Now, I started out by saying that there are times when I wish I could be a Democrat. I said this because they do have many admirable ideals, chief among which is care for the less fortunate. But the thing is, unlike ensuring that our government protects the fundamental principles of life and family, the impact of which can only most fully be realized through government, care for the poor can be (and most often is) attended by charitable works that are not governmental in nature. In other words, you don’t have to work through the government to care for the poor, but you do have to work through the government to ensure the right to life and the fundamental character of the family. Therefore, if we must, sadly, choose between a government that protects life and the family and one that is focused on economic good, it seems clear to me that we must opt for a the former. The good news is that in doing so, we don’t have to leave care for the less fortunate behind. In fact, I would suggest that a more effective and laudable approach would be for us to make personal, active investment in the care of the less fortunate. Give to charities. Volunteer in charitable works. Give to those who ask and even to those who do not. It is much more blessed and, indeed, enjoyable to choose to give than to be forced to give by your government. And if we all did it, we wouldn’t need to try to make each other do so through the government. So that’s how I think about choosing whom to vote for. I hope that there are those who will find some help here, and if nothing else, I hope it will help those who are of a differing persuasion to see that despite the rhetoric, there are good reasons to make issues like abortion, euthanasia, marriage, and family deciding factors in deciding how to vote. These issues are fundamental and primary for society and government and will therefore have a much more profound and long lasting impact than other, albeit important, issues like foreign policy, economic policy, and national security. It’s not a matter of laziness or simplemindedness; it is a matter of principles. Mr. J. Ambrose Little, O.P. UPDATE (11 Sept 2008): Seems that Pelosi and Biden's remarks have provided a very timely opportunity for the Church to reiterate her changeless teaching on these crucial issues as well as provide more solid guidance for Catholic (or just plain conscientious) voters. UPDATE (14 Sept 2008): I just ran across this little video on CatholicVote.com that kind of says in pictures what I say above. I should say the conclusions about the primacy of life and family are the same, though I deal with it from a not-specifically-Catholic perspective in my text. UPDATE (12 Oct 2008): Just noting more bishops reinforcing this. Bishop Joseph Martino of Scranton (where Biden likes to point out he hails from) and Bishop David Zubik of Pittsburgh. Bishop Martino is one of the clearest and forceful messages on this issue so far. UPDATE (22 Oct 2008): Most Reverend Kevin J. Farrell and Most Reverence Kevin W. Vann (of Dallas and Ft. Worth, TX, respectively) have offered yet more clarification (PDF) on these issues. UPDATE (1 Nov 2008): This'll be my last update I expect, given the nearness of the election. I've come across a few more bishops speaking out, but I was pleased to find that someone's been keeping a lot closer tabs. Over 115 U.S. bishops have spoken out in recent months to defend the (true) Catholic position on these and related matters as they pertain to our participation in the democratic process. Honestly, this is amazing and heartening. Our bishops seem to be hardening their collective backbones. Kudos to them and thank God. It's always nice to see the little boogers kicking around, even in low fidelity, and the other kiddies enjoyed it too. It's very clear that there's a person there, and he already bears the name Thomas Martin Bonaventure, after St. Thomas Aquinas, St. Martin of Tours, and St. Bonaventure. So it was with that in mind when I bumped into the news that Speaker of the House Nancy Pelosi totally misrepresented the Catholic position on abortion in an interview on Meet the Press. Thankfully numerous Catholic bishops have spoken up to provide the accurate Catholic position, but it's unfortunate that it happened because no doubt there will be plenty who take what she said at face value and never hear the correction. I must say I was very surprised. I mean, most politicians who identify themselves as Catholic at least have some integrity to dodge the issue by saying that their personal opinion should not be their public policy, which of course is deeply questionable in itself, but to outright contradict one of the most well-established Catholic doctrines--established in one of the earliest Christian documents we have and held since--and say it is an okay position for a purported "ardent, practicing Catholic" to hold is just plain wrong. It may be challenging to argue against abortion without reference to Divine revelation, but it's just plain easy to do with it. I mean, come on. I just ran across Alan Cooper's keynote at Agile 2008. The gist is that he's making the case for integrating interaction design into Agile development, something that is near and dear to me, as well. I was pleasantly surprised by his talk, and I recommend it to all my dev friends. You can quickly scan through the slides and his notes to get the whole story. I'm not sure if I could have said it better myself! I'm heading out to San Francisco Monday to get my UX on at UX Week 2008! It's my first time both in the city and at that conference. Looking forward to meeting new folks and talking about making great software experiences. If you're in the area or at the conference, send me an email (ambrogio[at]gmail) or ping me on crowdvine. I'd be glad to get together to talk about UX, software, architecture, whatever!